Just over a month ago, I set myself a little personal project, I decided to research the various official Sonic Mascot costumes which have been used over the years, I wanted to see how they changed, if there was any relation in design to the games, as well as how other regions created their mascots. It was supposed to be a short project, I thought ‘there can’t be ‘that many, this will probably be just a 5 min video at best’, I was very wrong. Not only did this project take a full month to complete, it ended up being one of the strangest research trips I have ever undertaken. You can view the full end result video at the end of the article. For now, enjoy these highlights. If you’ve ever attend any video game convention or event, chances are you’ll see at least one official mascot, every big publisher tries to have one near their stand. They’re like people magnets, you put a mascot at your stand, people go over to it, it’s a great way to get people to look at your game who may have otherwise past it by. During the madness which was Sonic 2’s release, Sega created a Sonic & Tails mascot in the UK. The costumes appeared numerous times in the pages of Sonic the Comic but also appeared in video form on Bad Influence’s 1992 Christmas Special. 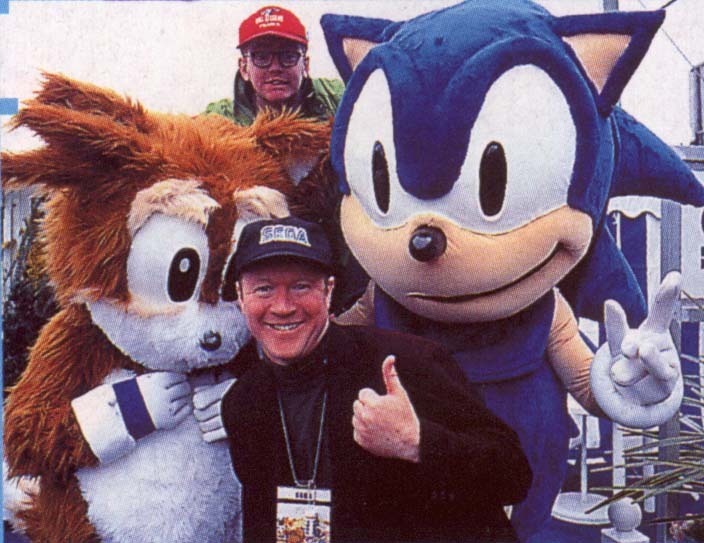 The Mascots also entertained visitors to the Future Entertainment show in 1992 as well as the 1992 Sega Championship Finals. 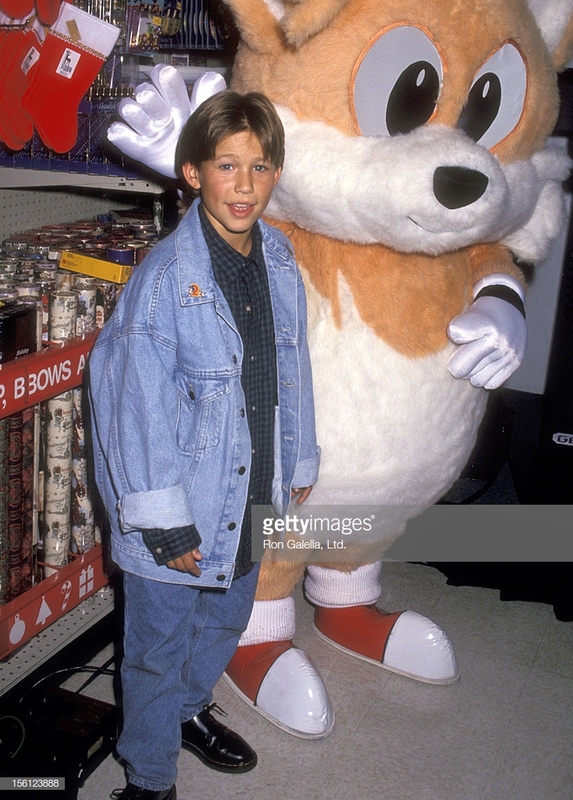 The United states also had their own Sonic & Tails mascots at this time, whilst the Sonic was similar in design, their Tails took a different approach, it was still huge but was much less furry and and was a different colour tone. 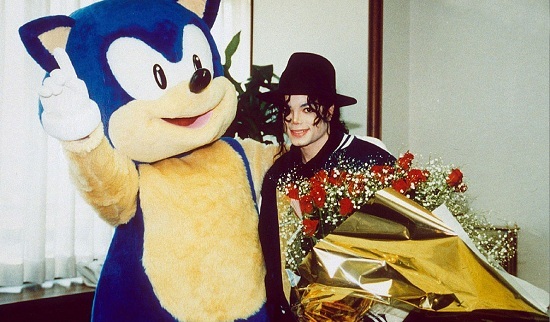 Japan had a few costumes around this time, but this is the most infamous of the lot, because it hung out with Michael Jackson during the promotion of Sonic 3. The costume has a very friendly look to it and a “Nice smile” but what you might not realise, the smile is actually a vital part of the design… it’s where the performer looks out of. 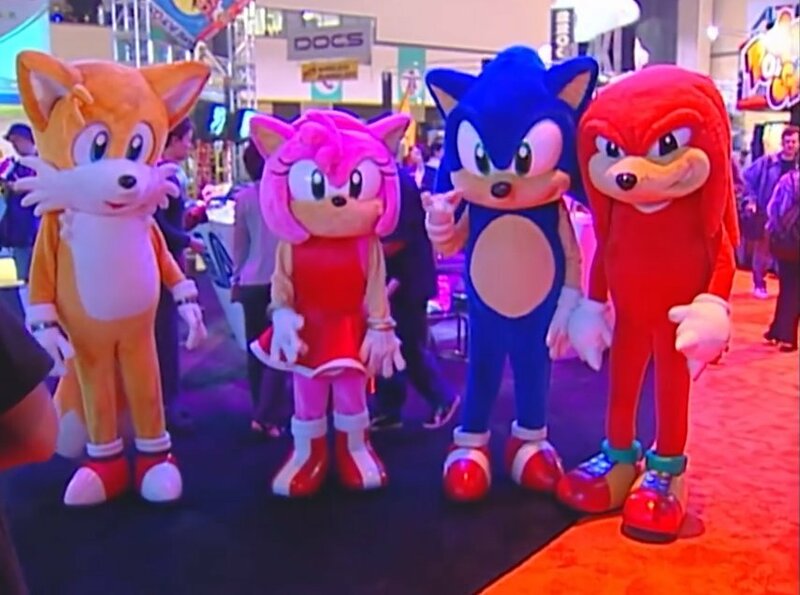 At the 1999 E3 expo, Sega debuted an entire cast of new costumes, Sonic, Tails, Amy and Knuckles all got the mascot treatment. 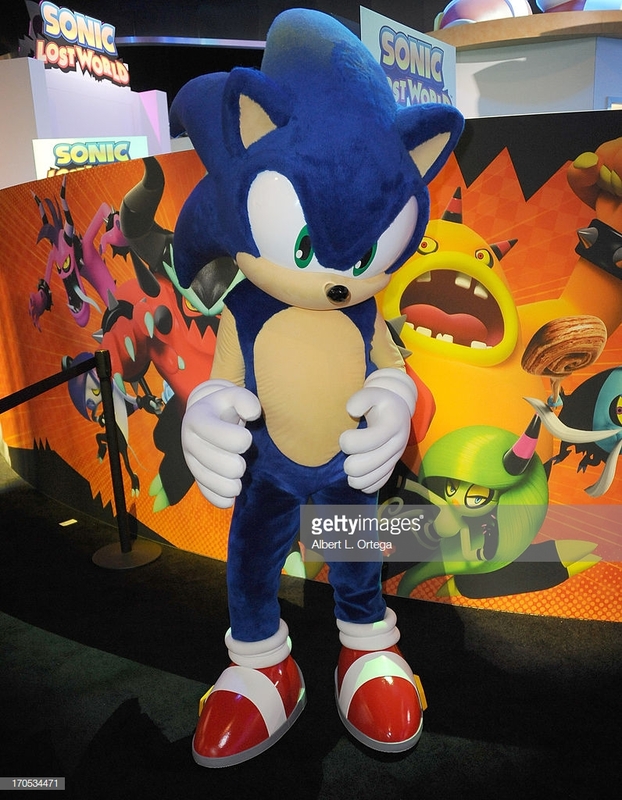 Whilst this was a major E3 for Sega, there exists very little media of the costumes at the event. However, the costumes were so good and popular that they also appeared at several events in Japan and were even brought back into service when Sega were promoting both Sonic Adventure 2, Sonic X and even Sonic Battle! Over time, Sega increased the number of characters to go along with this line, such as Rouge, Shadow, Eggman and even Cream! 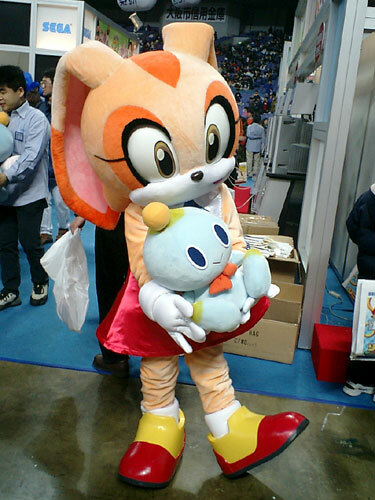 Cream made her only appearance at the 2002 Worlds Hobby Fair in Japan and from all accounts has never appeared at any other event since. 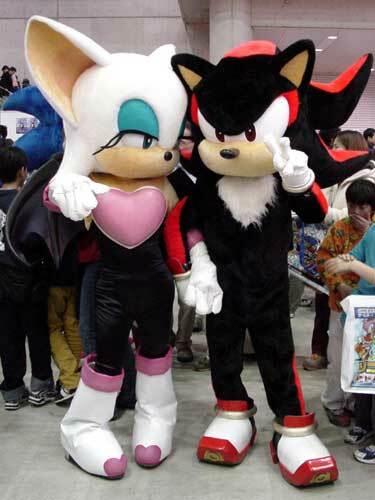 Shadow and Sonic’s costume was brought back temporarily to help promote Shadow the Hedgehog, but the other cast would remain dormant until eventually re-designed for later events. This is probably the longest running Sonic costume in history, probably because it’s so good! 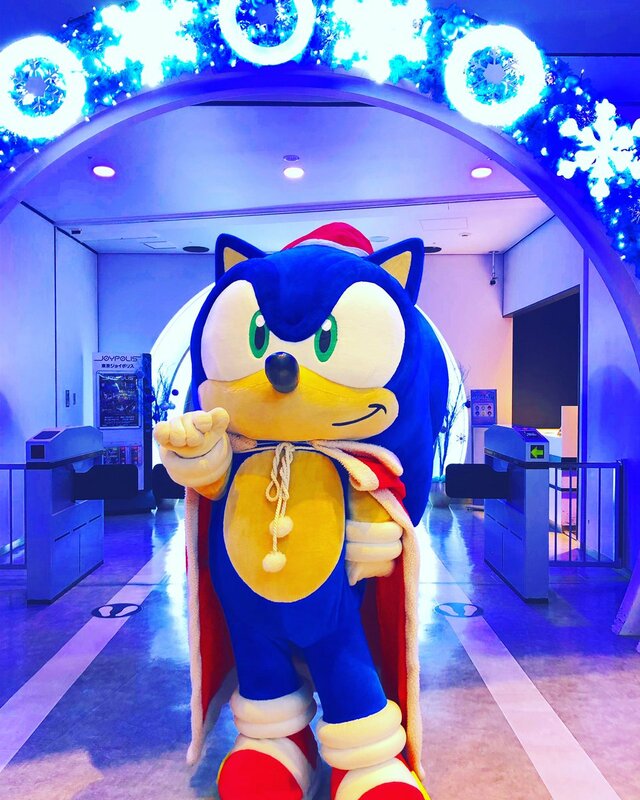 Tokyo Joypolis has had this guy entertaining guests for at least 10 years, he’s normally available daily for photos at the park and during special occasions like Halloween and Christmas, Sonic will often dress up to get into the spirit of things. Sega Republic was Dubai’s answer to Tokyo Joypolis, a huge indoor theme park with Sega themed rides and attractions. 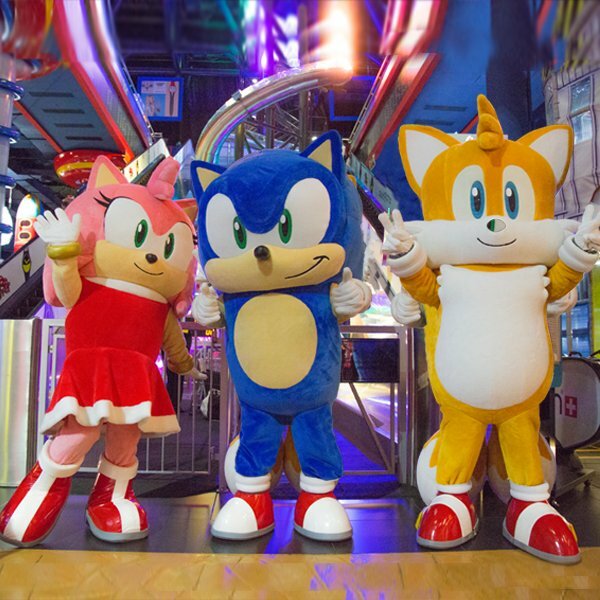 To help promote the park, they had three mascots based on Sonic, Tails and Amy. 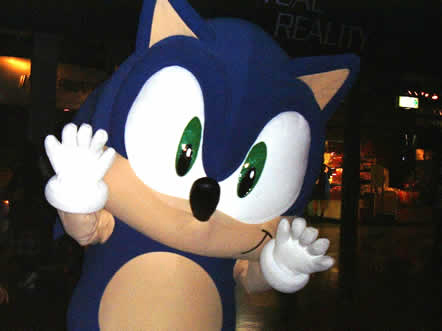 Whilst Tails and Amy were reserved for media events, Sonic was a daily sight in the park, guests could get a photo with him and he would even attend birthday parties which you could book at the park itself! 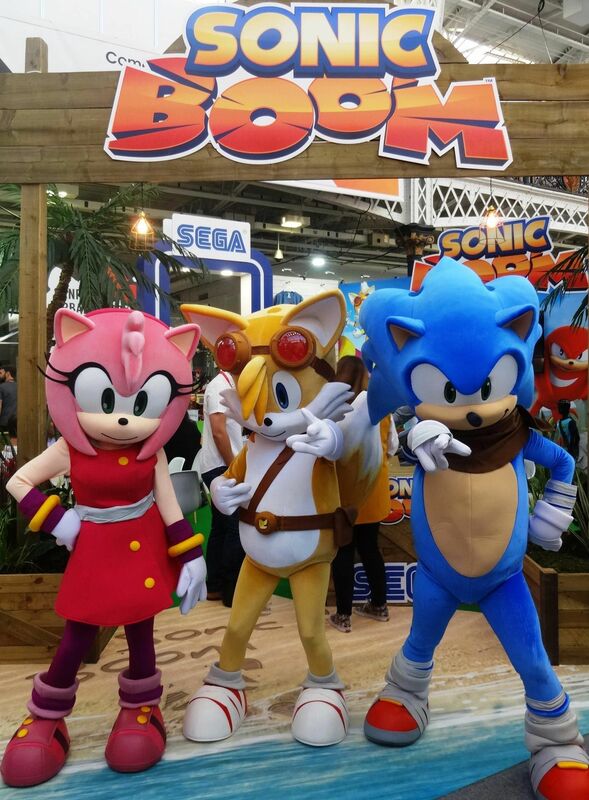 Regardless as to what you may think of Boom, a lot of effort went into these creations, Tails and Amy especially since they’re completely original. 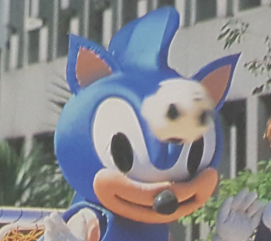 Whilst the Sonic was based off the main Sega Sonic costume used at the time, they still went to the effort to give him new shoes and accessories. Chances are you are more than familiar with these two costumes, they have been used at almost every video-game event since 2010, the above one has been a regular feature of Summer of Sonic. The modern design has slimmed down the costume from the more bulky ones seen in the 90’s and in Japan, this means the performer is able to make more energetic motions, at Summer of Sonic this costume was even seen dancing with Crush 40 on stage and even attended the Alton Towers Sonic Spinball launch event and entertained guests with a number of recognisable poses. This costume uses much higher grade materials which means it still looks really good after a long days use. The shoes are much higher quality and it has a ‘nice smile’ instead of the creepy Sonic Heroes grin that the other costume has. It was only ever used for one Tokyo Game Show, yet… look at it! 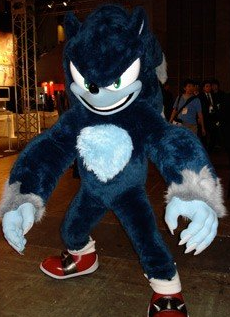 They made a Werehog costume to help promote the launch of Sonic Unleashed, despite the size of the costume the performer is able to move very easily in it. And from what I can tell… it was used for less than a week at one event, despite being one of the best costumes Sega have ever made! This was just a little look at some of the better and most iconic costumes which span the 27 years (technically 28) in which Sega have been promoting Sonic. There are many more and some of them…. Check out the video below if you’re interested and want to see the full history since it’s quite in depth. 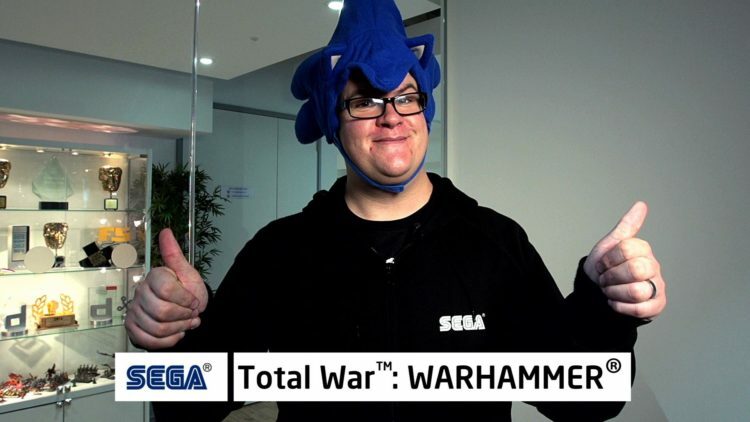 So… I felt it was necessary to write this because I think it’s important to praise a great job and after AAUK left Sega Europe as their main community man, European fans of Sega went through a bit of an ‘urm… ahhh… urm…’ with regards to outreach and connection with Sega and community. We’re not going to talk about that period today, instead we’re going to talk about someone who did a lot of good for Sega in Europe. With regards to community engagement… This is just a small sample of what Dan did, or at least was the main front man of in terms of community within his first month of being in the role. Started a ton of giveaways for some pretty amazing stuff. We’re talking promotional merchandise items for some videogames, collectors editions of games, sega employee hoodies and various other very exclusive hard to get items. Organised and ran a community party for Sonic Lost World’s PC release and invited the community, free entry, goody bag (which included a free copy of the game) and there was an open bar… Yes my friends, I can sit here and say that we got drunk thanks to Sega. Although we liked Lost World on the PC before the booze started flowing. Completely turned around Sega Central which many fans had stopped watching because it was cringe worthingly bad. Oh yes, and at the end of each episode lots of codes were given out for free PC games, sometimes codes would unlock multiple games, so that’s always a good thing. Actively reached out to the community, even I was contacted at one point to help run a giveaway and review a bunch of games, I know of several other people on YouTube who were also contacted and reached out to. However… one of the best things I ever saw him do was at the Sonic Lost World party, there was a fan there who was very shy, so for a large part of the day, Dan sat with this person and just talked to them, what about? Just… anything. Just sat and talked and made them feel welcome and I think it probably did help with them feeling more relaxed as they seemed to ‘warm up’ as the event went on. But it didn’t end there, he also gave this person one of the red Sonic Christmas Jumpers which at the time hadn’t been released. I’m pretty sure that someone who was at this even nominated him for a community manager award because they were so impressed with how he made this fan more at ease and to ensure that they had a good time and didn’t feel alone at this event. Then there was other amazing moments too, such as the day before Western Super Sonic, a rather large box from Dan turns up, when we opened it up, it was full of free items for giveaways at the event. Free stuff is always nice, but I wanted to write this not just for his brilliant work with the fans face to face (as illustrated by the Lost World party note earlier), Dan has been quite brave in the stuff he’s had to do. Practically being the face of Sega Central, coming to it after many fans hated the show and turning it around as he did could not have been easy. Yet on every occasion he puts in a lot of energy for someone who was clearly nervous in his first few episodes. He clearly researches and cares about the material he’s talking about, and that’s the key point, he clearly cared because we the fans, be it of Sonic, Football Manager, Alien Isolation, Yakuza, Dengeki Bunko: Fighting Climax or even Aliens GodDam Marines, also cared about the things we love to play. And even though I’m still bitter over not winning the Alien Isolation robot USB storage device in the first giveaway… He’s done a very good job of which he should be very proud of, I only hope that whoever takes over is just as good and just as engaging with the community as he was. Best of luck in the future. I hope they let you keep the hat. P.S. Whoever takes over the role as EU community manager, can we have another community party with an open bar… and cake! Ouch. Bad news for employees of the European branch of SEGA, as its been revealed that the company has confirmed multiple redundancies in the effort to reconstruct its departments. This reconstruction includes both the Sonic the Hedgehog and mobile game departments, two pretty big players for SEGA right now – especially considering the massive shake up happening to the Sonic franchise with Sonic Boom coming later this year. This comes following layoffs late the previous year as a reaction to the “ever-changing environment” of the game industry, and closures of several offices in both Europe and Australia back in 2012 to focus on their four main franchises: Sonic, Aliens, Football Manager and Total War. Regardless, all the best to the people affected by this move for the future! SEGA Europe has released seven more screenshots from Sonic the Hedgehog 4: Episode 2 on their website. Not much is shown that we haven’t already seen, apart from the revelation that the red rings from Sonic Colours and Sonic Generations are returning. For those who haven’t played those two games, the red rings are collectibles that unlock bonus content, giving the game some replay value. Check out the rest of the screenshots after the jump. 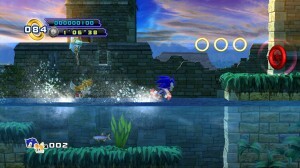 Latest SEGA Europe Release Schedule Lists Sonic Generations For PC, 3DS Version Delayed? The evidence for a PC version of Sonic Generations is really mounting up. SEGA Europe has issued a schedule for their upcoming game releases through 2011 and into 2012. Sonic Generations is down for the already known release month of November for PS3, Xbox 360 and…PC? It appears SEGA may have let the cat out of the bag again for the PC version of the game, surprising no one. What IS surprising though is the absence of the Nintendo 3DS version. SEGA Europe’s website also has no month scheduled for the portable version and instead lists it for a Late 2011 release, even though it was previously given a November release month. Could the 3DS version of Sonic Generations be getting released slightly later than the home console (and possible PC) versions? We’ll pass along any further details regarding both stories when they’re made available. Summer of Sonic 2010 attendees may remember seeing Nintendo Europe staff filming at the convention and by now wondered whatever happened to their coverage. Well, if you own a Wii and have it online, you can now check out their video from SoS on the Wii Nintendo Channel, together with some footage from Gamescom 2010. Nintendo caught plenty of fans in their video and spoke to some familiar faces in the Sonic community at SoS, so see if you can spot yourself. You’ll also hear from SEGA Europe’s Michelle Dix about the Sonic fandom and newly released game Sonic Colours, as well as from special guest Jun Senoue about creating Sonic game music. Finally, SEGA’s David Corless speaks from Gamescom about evolving the Sonic brand and keeping it fresh. Check out the video on the Wii Nintendo Channel and share your thoughts in the comments. Videogame retailer GAME are holding a big videogame trade fair called Gamefest in Madrid this year and SEGA Europe will be attending, along with other big names in the business. This will be the first of what is hoped to be an annual show for the capital, on par with E3 in Los Angeles and the Tokyo Game Show in Japan. Gamefest will be open to the public, allowing attendees to try out all of the upcoming game releases before they hit store shelves. SEGA will be bringing their future releases, though no list of games has been given on their page on the Gamefest site, but they do say that you will be able to meet Sonic. SEGA will be located at stand 17. If you’re interested in attending, the event is being held from October 8th to the 10th in the exhibition site Recinto Ferial Juan Carlos I de Madrid. Doors will be open from 10am to 8pm and tickets can be bought at GAME.es for 3,00€ each, but unfortunately only Friday and Sunday tickets are still available. Saturday appears to be sold out. Sonic Classic Collection bringing Sonic’s legendary Mega Drive titles to a portable platform has just been released today in Europe for Nintendo DS and to mark the occasion SEGA Europe have issued a press release and a launch trailer showcasing the game in action. SONIC CLASSIC COLLECTION OUT NOW! LONDON (12th March, 2010) – SEGA® Europe Ltd. and SEGA® America, Inc., are pleased to confirm that Sonic Classic Collection™ is now in stores. For the first time ever, the original games from legendary gaming icon Sonic The Hedgehog™ – Sonic The Hedgehog, Sonic The Hedgehog 2, Sonic The Hedgehog 3 and Sonic & Knuckles – will be playable on the Nintendo DS™! 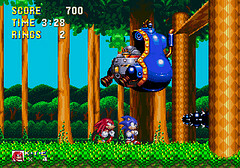 Sonic Classic Collection allows fans both old and new to speed through the much loved zones of the four original Mega Drive adventures, in a bid to collect the chaos emeralds and save the world. Optimised to take full advantage of the Nintendo DS system, Sonic Classic Collection will feature a new save anywhere feature, a first in this original series, meaning that the games can be enjoyed anywhere, anytime! 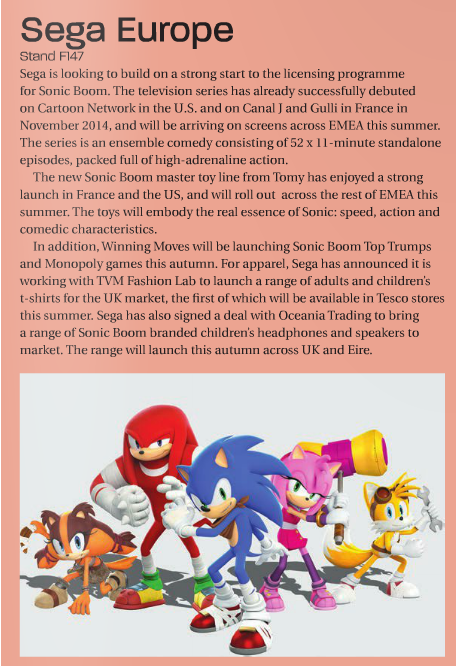 Thanks to Sonic Wrecks owner and SEGA Europe Community Manager ArchangelUK for the heads up! SEGA Europe have just released this new DS trailer for Sonic & SEGA All Stars Racing giving you a better look at what alot of the tracks, characters and All-Star Moves will look like in the palms of your hands. Thanks to mickybyte for the heads up! Just a quick heads up, SEGA Europe and SEGA Australia have posted up a new trailer for Sonic & SEGA All Stars Racing showcasing alot of the character rosters All Star Moves including some we’ve never seen before. You also get a glimpse at a wide variety of the tracks too. Thanks to BlueHedgehog92 over at the SSMB for bringing this to our attention. 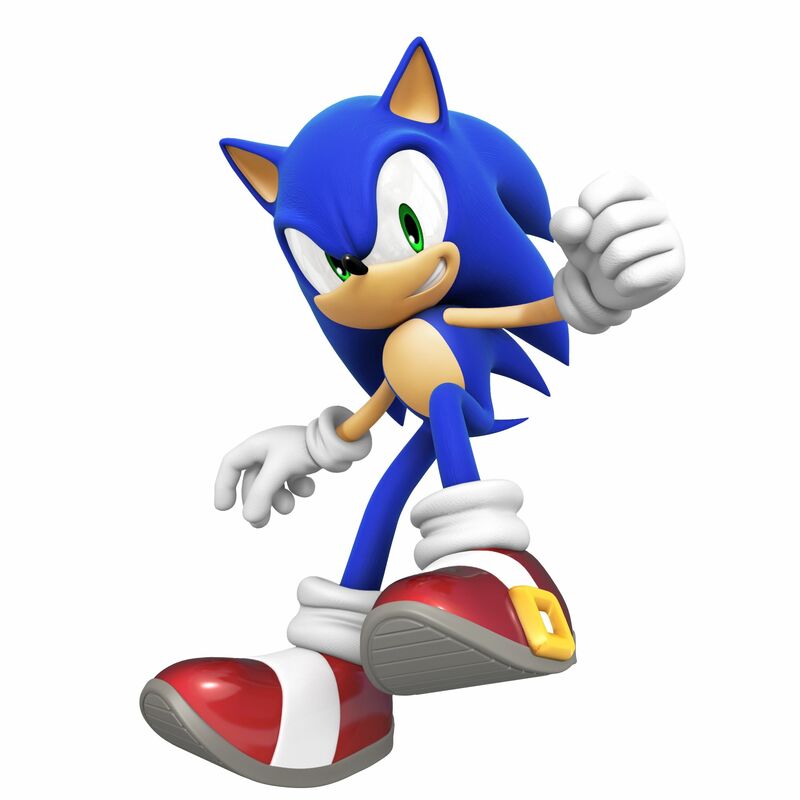 LONDON & SAN FRANCISCO (TBC, 2010) – SEGA® Europe Ltd. and SEGA® of America, Inc. today announced the first game developed specifically for the download market from the world’s fastest hedgehog. Sonic the Hedgehog 4 Episode I will be available via download on Microsoft XBLA, Sony PSN and Nintendo WiiWare, bringing with it the addictive classic 2D side scrolling action that Sonic fans have been waiting for. Sonic the Hedgehog 4 Episode I will be available in Summer 2010 for XBLA, PSN, and WiiWare. For more information about Sonic the Hedgehog 4 Episode I please visit http://www.sega.com and for assets please visit www.sega-press.com. SEGA® Europe Limited is the European Distribution arm of Tokyo, Japan-based SEGA® Corporation, and a worldwide leader in interactive entertainment both inside and outside the home. The company distributes interactive entertainment software products for a variety of hardware platforms including PC, wireless devices, and those manufactured by Nintendo, Microsoft and Sony Computer Entertainment Europe. SEGA Europe’s web site is located at www.sega-europe.com. While the Sonic Community begins its charity drive for Sports Relief, SEGA Europe has banded together to raise money for another cause – the victims of the devastating earthquake in Haiti’s capital, Port-Au-Prince. 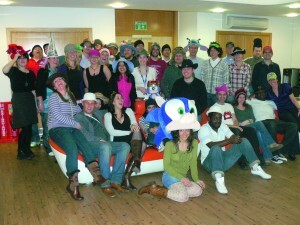 The company staged a Hats For Haiti fundraiser, which saw employees donate for the opportunity to wear silly hats. The initiative raised £780 for the cause, which will help provide aid to those who need it most in Haiti. The image above is a group photo of the turnout, with even Sonic making an appearance (albeit in half-a-head form). According to ArchAngelUK, the canteen served “‘H’ related food” which included hot dogs and hamburgers. If you wish to help contribute to the emergency appeal, you can donate via the Red Cross website. 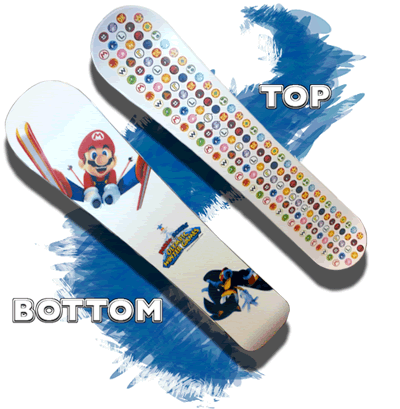 We told you before that we would tell you when another Mario & Sonic at the Olympic Winter Games snowboard would be given away. Well… I’d hate to not fulfill a promise. * The name & description of a cool made-up snowboarding trick! “IceCap Dash” – Sonic does a 360 rotation while spin dashing on the board! “Space Harrier” – Hang in the air for more than 5 seconds, with a rocket pack attached to your back! You don’t need to be this literal. Be creative & cool and have fun with it! Your snowboarding trick idea can be Mario & Sonic-based, Olympic Games-based, OC ReMix-based, it can be ANYTHING! The coolest snowboarding trick sent in will win! 2. You ALSO must be subscribed to the OC ReMix YouTube channel. YouTube is how we’ll contact you if you win! Click http://tr.im/yOCR to subscribe! Entries are due on Monday, January 18th, 2010, 11:59PM EST (GMT -5). You can enter as many tricks as you’d like, but try to keep it to ONE e-mail. The OCRemix judges panel will decide the winner and inform you via YouTube. This contest is not limited to the UK. It is open to everybody! SEGA Europe and SEGA Australia have just revealed on their product page’s for Sonic & SEGA All Stars Racing that the game will be revealed on all 5 platforms PS3, Xbox 360, Wii, DS and PC Friday 26th February 2010. No U.S. date has been confirmed yet but many retailers are listing it down for a 23rd February release, if true then Europe will only have to wait 3 days so not much difference there. 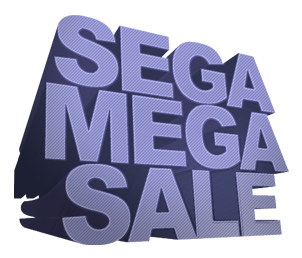 SEGA Holding 40% Off Mega Sale on PSN(U.S. Only) And Wii V.C. SEGA of America and SEGA Europe are having a 40% Off Mega Sale in the spirit of the holidays on PlayStation Network(U.S. only) and on Wii Virtual Console. Wether it’s classic games, PSP games or DLC SEGA have got you covered. There’s no mention on the SEGA Europe blogs or the PlayStation Store Update on the PlayStation Europe blog of a PSN sale in Europe so we’re left to assume the sale is only on the U.S. PSN. If we hear any different we’ll update this article and let you know. 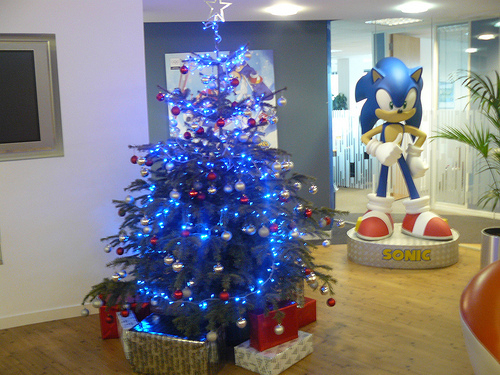 An under-the-radar post on SEGA Europe’s Flickr account reveals their holiday cheer, a Christmas tree with blue lights! And that’s all I got to say about that. Hit the break for another photo. SOA & SOE Issue Press Release’s For ASR B-K & Avatars. Feb 2010 Release In U.S.
SEGA of America and SEGA Europe have issued a press release regarding yesterdays official announcement of Banjo-Kazooie and Avatar’s presence in the Xbox 360 version of Sonic & SEGA All Stars Racing. An high quality trailer has also been released on SEGA Europe’s website. SEGA of America have also uploaded the U.S. version of the trailer to their YouTube account. LONDON & SAN FRANCISCO (18 December, 2009) – SEGA® Europe Ltd., SEGA® of America, Inc. and Microsoft today announced an exciting new partnership for Sonic & SEGA All-Stars Racing™. 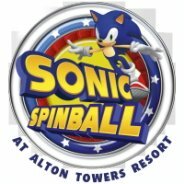 For the first time ever in a racing game for the Xbox 360® video game and entertainment system, you will be able to jump in to the game in the form of your Avatar and race against your favourite Sonic & SEGA characters. 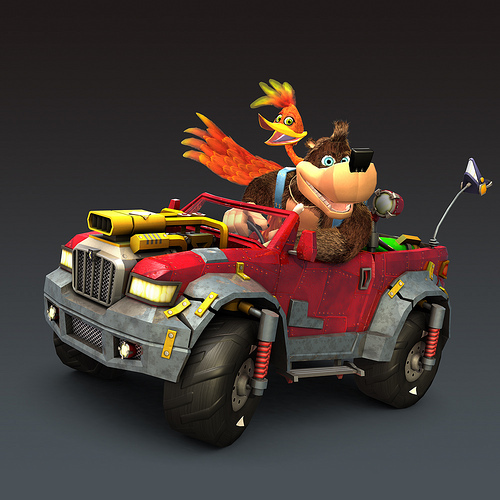 In yet another addition to the character roster and exclusive to the Xbox 360 version, Banjo and Kazooie will make a welcome return to the console and take to the starting grid in their Bolt Bucket all terrain vehicle! Working closely with the Rare Studio to bring the popular characters to life, Sonic & SEGA All-Stars Racing sees Banjo and Kazooie taking their place on the starting grid alongside classic SEGA characters such as Sonic, AiAi, Amy, Knuckles and Ryo Hazuki. As well as mastering the drift system to get the best out of the tracks, and picking up weapons such as Sonic speed boots and homing rockets along the way, Banjo and his faithful sidekick Kazooie will be able to unleash their own unique All-Star move in a bid to cross the finish line in pole position! 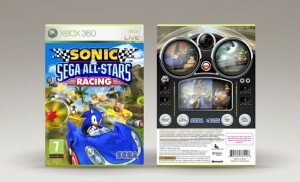 Sonic & SEGA All-Stars Racing will also be the first racing game for the Xbox 360 to feature fully playable Avatars. Have you ever pictured yourself speeding around the lush green hills of Sonic’s Seaside Hill Zone? Or wondered how you’d look rolling around the levels of Super Monkey Ball? Sonic & SEGA All-Stars Racing will allow your Avatar to hop in to the All-Stars Racing “Avacar” and put your pedal to the metal around SEGA world inspired tracks! If you find yourself towards the back of the race, or taking hits from everyone’s weapons, it’s your friends that will come to your rescue in the Avatar All-Star move, with recognisable faces from your Xbox LIVE Friends List offering a helping hand! Sonic & SEGA All-Stars Racing sees Sonic and friends speed around tracks set in medieval castle ramparts, lush rainforests and bustling cities, all taken from the visually rich and varied universes of Sonic and SEGA. Are you gonna be faster than Sonic? 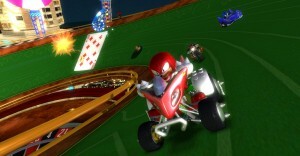 Sonic & SEGA All-Stars Racing featuring Banjo Kazooie will be in stores Early 2010. Sonic & SEGA All-Stars Racing featuring Banjo Kazooie will be in stores Feb 2010. Let’s hope a European release month/date is revealed soon. SEGA Europe have officially unveiled Sonic Classic Collection for Nintendo DS, a game most in the community have known about since it’s appearance at the BBFC website we reported on. We also revealed the game was headed for Nintendo DS after it appeared at the OFLC website. Sonic Classic Collection for the Nintendo DS™ system will hit stores in March 2010. Thanks to bolt7 at the SSMB for bringing the news to our attention. SEGA Europe also have the press release at their website and a product page set up with the game’s box art. Look’s like someone revealed something they shouldn’t have, namely the above image. After yesterdays revelation of this ‘work in progress’ Sonic & SEGA All Stars box art Chris Lewis’s site has been blocked, no doubt by Sumo Digital and SEGA Europe. Using the ‘down for everyone or just me’ tool you can see the site is blocked from everyone. The mysterious disappearance of the website appears to add credibility to the fact that the image is leaked, but as with all things we can never be too sure. We just won’t be surprised if a popular bear/bird combination actually does appear in the game. The question is, WILL YOU? Seem’s SEGA have another Sonic collection title on the way as if we haven’t been given enough already. SEGA Europe submitted Sonic Classic Collection to the BBFC on the 11th November where the BBFC have today given it a U rating and have made no cuts. With a Sonic Chronicles video features could we be seeing this game hitting the DS? We’ll keep you up to date if and when more information is made available. For now, check out the full rating here. After the news of the Mario & Sonic at the Olympic Winter Games pre-order t-shirt at HMV ArchangelUK over at the Sonic City Blognik has revealed SEGA Europe’s second piece of merchandise. The item as seen in the above photo is a sticker sheet of various pieces of art for the playable characters included in the game. Alot of the art you will have seen on the games website but a few pieces are new such as the Bowser art. AAUK hasn’t revealed what SEGA Europe plan for the sticker sheets but we’ll let you know as soon as any information is given. SEGA Europe have revealed to MCV their UK marketing plans for Mario & Sonic at the Olympic Winter Games and it’s set to be SEGA’s biggest campaign ever. 90 second ads costing millions of pounds will be shown alongside big shows such as the X Factor and on five kids channels on launch day. Sega estimates that 93 per cent of housewives and 88 per cent of kids will see the advert 11 times each, while 80 per cent of 16 to 34 year-old adults will see the advert eight times each. 8 million cinema goers over the span of 5 months will see 30 second ads for the game before family and childrens movies. SEGA has secured 5 front covers of various magazines over the course of 6 months and will be print advertising the game for 3 months. SEGA will be running online ads on various key specialist and lifestyle sites for 4 weeks. – In-store events across 40 retail outlets. Looking to be a very exciting game launch, we’ll be keeping an eye out for more info so stay tuned to TSS in the coming weeks. SEGA Europe and SEGA of America have updated their format listings on their Sonic & SEGA All Stars Racing game pages. The Playstation 3 version’s listing has been changed to Playstation Network indicating that format will now only receive a downloadable version of the game on the Playstation Store. This version is still listed for release in Early 2010, so the change hasn’t affected the release date period. With the early unveiling of PSP GO (the newest PSP model which can only play games downloaded from Playstation Networks Playstation Store), could this sudden change mean there is now a PSP version on the way to help support PSP GO? SEGA have always supported PSP so it’s possible. SEGA of America’s game page also lists a PC Download version of the game for an Early 2010 release which has been listed there and in the trailer since the games unveiling but is still absent from SEGA Europe’s game page. We’ll let you know if/when this version gets announced for Europe. UPDATE: In an update at the Sonic City Blognik ArchangelUK informs that the competition is now open to all countries. SEGA Europe together with entertainment and media news website Digital Spy are offering you the chance to win one of only two copies made of the Japanese Sonic and the Black Knight script. Even better it’s signed by the game’s producer Tetsu Katano. ArchangelUK tells us in his latest Sonic City Blognik entry that he has the other one but with a bit of luck and by answering a simple competition question you could be the lucky owner of the second one. Three runners-up will get a Sonic and the Black Knight inflatable sword and a SEGA vinyl sticker. Entries are to be one per household and are to be in by Friday, April 10, 2009 at midday. You can check out the question and full competition details at Digital Spy’s website. SEGA Europe have revealed the UK release date of the next installment in the Sonic Storybook series on Nintendo Wii, Sonic and the Black Knight. The game will hit UK stores Friday 13th March. Let’s hope the release goes well despite being released on the 2nd of this years Friday the 13th’s and on the same day as Resident Evil 5’s release. Thanks to MK Skillz at the SSMB for the tip. Will any of you be picking Sonic’s sword slashing adventure up? Let us know in the comments. 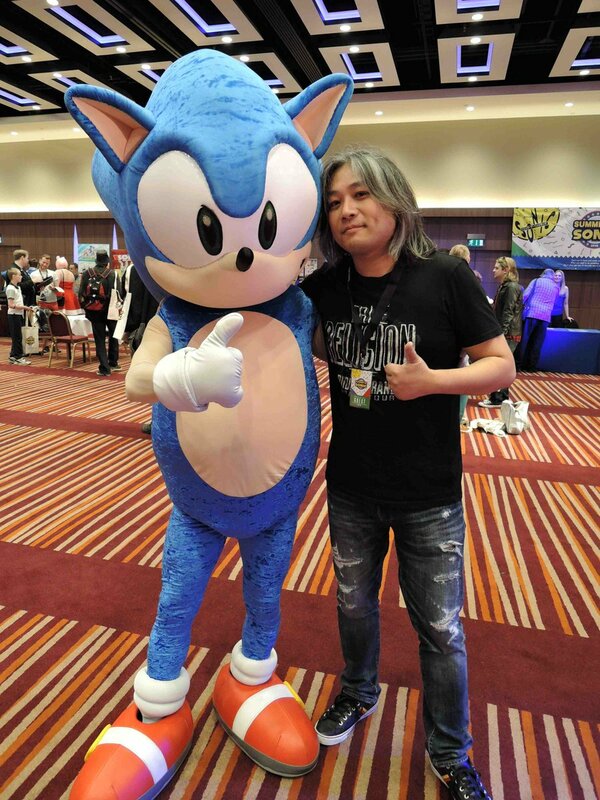 As we write this, print and major online journalists are most likely awaiting (or on their way, no thanks to the snow) to become an audience with Yuji Naka, famed programmer of the original Sonic the Hedgehog. Now the leader of part-SEGA funded studio PROPE, he will visit the European headquarters of the publisher to talk about Let’s Tap. So it can be assumed there will be a European release. From what we gather, there may be some announcements or two on top of this, but it’s not certain whether said news will relate to the inevitable EU release of the future tapping game or be something else entirely. Other high profile SEGA games, such as Madworld and Sonic and the Black Knight, will be playable for the press today as well, so you can expect some previews appearing in your favourite magazines soon, along with interviews of Naka-san. Unfortunately, TSS couldn’t make the trip today – we’re washing our hair. But keep an eye out as we will be on the trail for all the news that trickles out of this very exclusive event. SEGA Europe’s Sonic Unleashed product page has been updated with the release date of the PS3 version of the game. The game will hit stores before Christmas on Friday the 19th December 2008. Mr. AAUK has also confirmed this in his latest Sonic City Blognik entry. 720p, 1080i and 1080p compatibility: The text is tiny but most PS3 games just list 720p on its own with no other text in that box, theres only 2 more words of text in there if a game is 1080i and 1080p compatible. Sonic ’06 was compatible with all 3 so it makes sense that Unleashed is too. Discuss over at the SSMB topic. The Sega Europe Community Blog has been doing a fair bit of Sonic Unleashed coverage over the last few days, with a daily dose of what’s actually in the game for those just waiting with anticipation to find out. 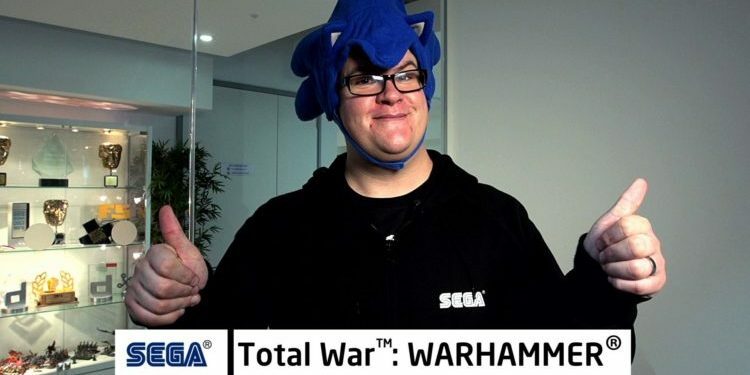 Today, the company’s European and American divisions worked together to kidnap interview the Lead Producer for Sega America, Patrick Riley, to ask him more about the upcoming Sonic title. It’s a fifteen minute long conversation featuring SOA’s ClumsyOrchid and RubyEclipse, SOE’s ArchAngelUK and Martin. The questions range from Werehog gameplay, the new moves that Sonic has at his disposal and the release of the game in the West before Japan. The guys really seem to want to hit home that this isn’t a return to the classic Mega Drive games but rather a brand new direction for the series. We wouldn’t have it any other way, long as it’s actually good. Look at Sonic Rush Adventure, after all. One thing that we found interesting was the influence SOA appear to have had during the game’s development, and the mention at the very end of ‘something nobody’s ever seen before’ which will very briefly take control away from Sonic. They pulled a fat rabbit out of the ridiculous hat with DarkSpines in Secret Rings, so we’ll be interested to see what happens here. Listen to the audio programme by clicking here (nice cockney there at the end, Martin). The Sonic City Blognik has daily updates in the only way an official blog can, so keep checking here. Sega Europe has revealed the box-art cover to Sonic and the Black Knight (sorry its so small, there are no larger sizes available at present). It look’s like their going with the Nintendo Power cover which was published for their exclusive first look at the game a few months back. No Wi-Fi logo can be seen, so that confirms there will be no Wi-Fi features. The game’s PEGI rating can also be seen on the cover, the game’s been given a 12+. Guess the European ratings board are getting pretty touchy again, no doubt the swordplay has them thinking “OMG SONIC HAS A SWORD, KIDS WILL COPY!!!”. Sega Europe have updated the European official Sonic Unleashed website with a release date for all formats. The game will hit stores Friday the 28th November. Except for the PlayStation 3, which will see a European release in December for some bizarre reason. Fans have been going crazy over the past few weeks digging at every source possible for a release date, ask Mr.ArchangelUK he’s been torn to shreds by rabid fans begging for a release date. Now European fans can get their pre-orders in and rest at ease until release day. For the release date and more info/media on the game check out the official site. ArchangelUK of Sega Europe community staff has updated the Sonic City Blognik with an important update regarding the European side of the Sonic and the Black Knight art contest. THIS IS FOR EURO ENTERIES ONLY AND IS VERY IMPORTANT. IF YOU HAVE SUBMITTED ON THE EURO SITES PLEASE RESUBMIT IT AS DUE TO A FAULT QUITE A FEW WE BELIEVE HAVE NOT COME THROUGH AND I DON’T WANT ANY OF YOU GUYS TO POTENTIALLY MISS OUT! SO PLEASE RESUBMIT YOUR ARTWORK IMMEDIATELY!!! Now, due to the issues with this and also the looooong delay in the other language sites going online we’ve managed to get the the closing date for European/Australian entries ONLY put back til Friday September 26th. Firstly, Sega Europe have captured ArchangelUK and dragged him back to Sega Europe’s London HQ and we at TSS welcome him back with open arms (and hands, where’s our presents? lol). Seriously though, welcome back to Mr.AAUK, we hope you enjoyed your trip. To the headline in question, AAUK has updated the Sonic City Blognik with some updates regarding the Sonic and the Black Knight art competition. Q: Can I enter? I live in (Country). A: Because of the way the Terms & Conditions had to be it wasn’t really possible to have EVERY country listed and have individual terms for them. So please take whatever the terms and conditions for whatever language you can read and simply assume any instance of (country name) being your country. So basically if you live in *deep breath* Austria, Belgium, Bulgaria, Cyprus, the Czech Republic, Denmark, Estonia, Finland, France, Germany, Greece, Hungary, Ireland, Italy, Latvia, Lithuania, Luxembourg, Malta, the Netherlands, Poland, Portugal, Romania, Slovakia, Slovenia, Spain, Sweden, the United Kingdom which are the formally recognised European Union members as well as Australia (which comes under SEGA Europe bizarrely), Iceland, Liechtenstein, Norway, Switzerland, Andorra, Liechtenstein, Monaco, San Marino, and should His Holiness wish to enter even Vatican City. You will need to send your entry to the same place as everyone else! PLEASE check out the Sonic & The Black Knight page for details of this and the information you need to include as this is vital. The deadline is still September 19th at this time so you will need to hurry. Q: Why does the US version of the site say you can include more characters? A: I have absolutely no idea. I suspect it just wasn’t updated. For the record you can draw Sonic, Knuckles, Tails, Amy, Shadow, Blaze and other characters (or any combination of one or more of them together) in your favorite scene from your favorite Sonic game. They must be Sonic characters, no fan characters or other series – showing Sonic punching Master Chief in the face might be fun, but won’t get in the game. So, with all queries, problems and issues laid to rest, get those pictures in, you have but 4 days European arteests.